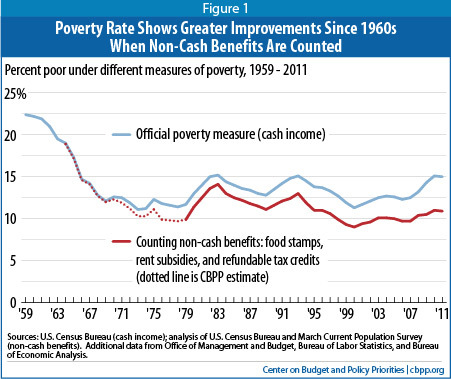 I was intrigued by President Obama’s claim that when one includes transfers that the poverty rate has declined substantially from the 1960s. 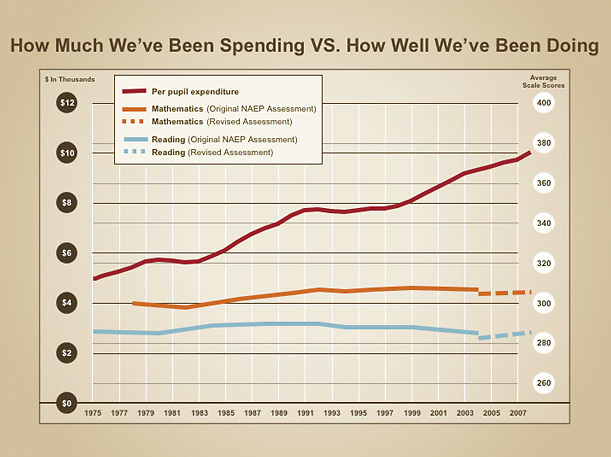 This would seem to represent a considerable problem for those attempting to waive off the poor performance of American public education based upon a poverty mantra. 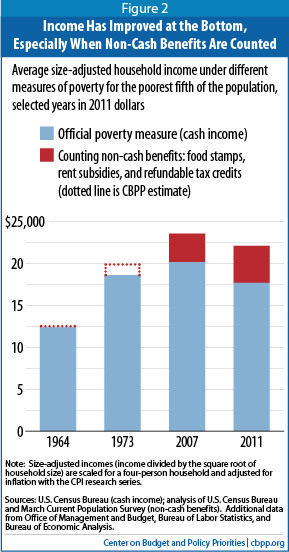 Spending up and poverty down makes for a tough sell. If you are squinting at that last one, it basically shows that the inflation adjusted (in constant 2011 dollars) income of the poorest fifth of Americans almost doubled between 1964 and 2011 once various transfers (food stamps, EITC etc.) have been taken into account. I’m back from SLC, where I had the honor of serving as the opening act to Indiana Superintendent of Public Instruction Tony Bennett. Getting back to the mad science of exploring the 2011 NAEP, and keeping with a sudden OCD fear that I have developed over the possibility of being reincarnated, I present to you the states you want to avoid and those you want to pray to be born into in the next go-around if you happen to be born as a child with a learning disability, and you would like to learn how to read by the 4th grade. So, whatever you do, try to load the dice to stay out of Washington DC, Hawaii, South Carolina, Alaska and Arizona if you think you might be coming back as a child with a disability. Conversely, you’ve hit the relative jackpot if you land in Maryland, Massachusetts, Kentucky,New Jersey or Florida. Seriously DC? 153?!? A mere 60+ point difference between next door neighbor Maryland? Except, well, it doesn’t really matter so much in terms of the gap. Below you will see a chart for Free and Reduced Lunch Eligible students with disabilities. 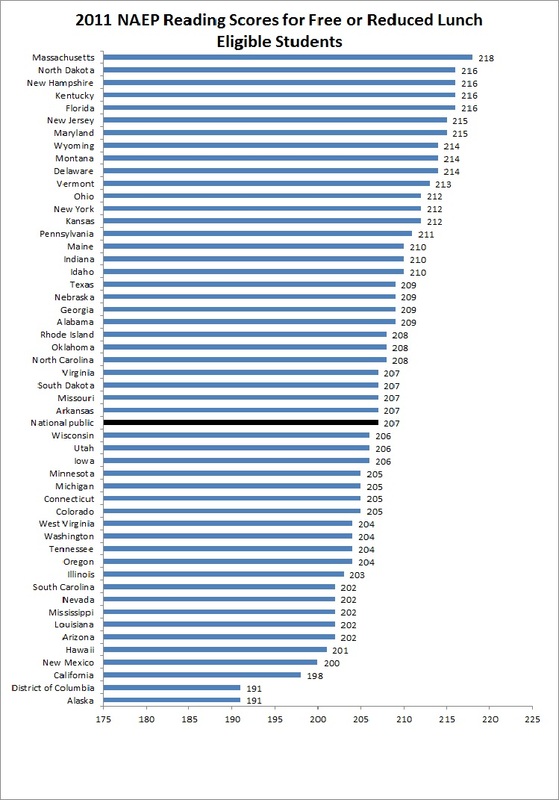 The top 5 get shuffled a bit, but there is still an appalling gap between DC and the top performing states. So as you make your reincarnation plans, just remember to stay away from DC, whereas if you have the misfortune of being born with a disability the chances of being academically warehoused seem to approach a near certainty. Sadly, DC has plenty of company at the bottom. If you want to learn how to read anyway, you need to stay away from Michigan, that is to say Detroit, if you are concerned about being born a poor Black child in the next life. 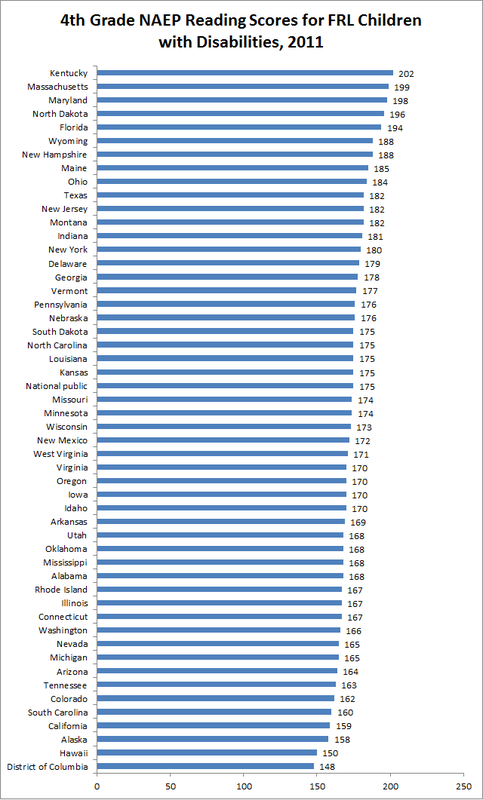 The 2011 NAEP says to stay away from Iowa, Maine and DC for good measure. On the other end of the scale: MA, NJ, DE, MD and FL are looking relatively good. Low-income Black children in Massachusetts reads a mere 2.5 grade levels ahead of their peers in Michigan on a 4th grade test. 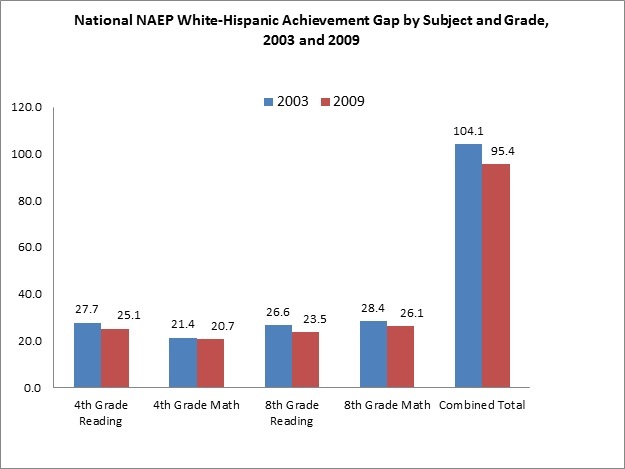 The chart on the right presents scores for Free and Reduced Lunch Eligible students on the 2011 NAEP 4th grade reading test. Memo to self: remember not to come back as a poor kid in Alaska or DC in the next life. Ten points roughly equals a grade level worth of progress. Low-income kids in Alaska and DC are reading almost as poorly as 1st graders in Massachusetts, which is to say, not much all. 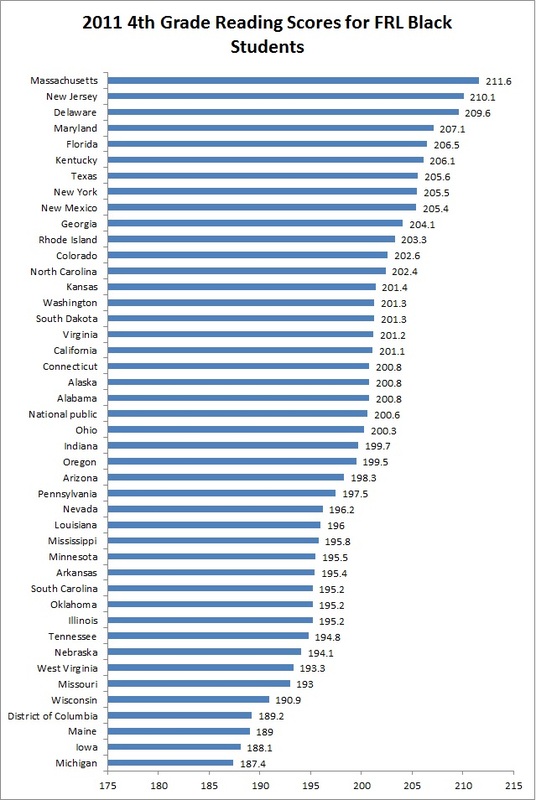 Florida hit a wall in terms of improvement (more on that later), DC saw nice math gains but not much progress in reading, Arizona finally started to move the needle a bit, and it is not entirely isolated to Hispanic children. The 2009-2011 scores are pretty “meh” so far, and this biggest story I am finding is something big and positive going on with Maryland’s reading scores: 8 point gain for FRL kids between 2009 and 2011, and a nothing to sneeze at five point gain among middle and high income students. So the early appearance of the 2011 NAEP has given me reason to update a project, leaving me with some interesting charts to burn off. 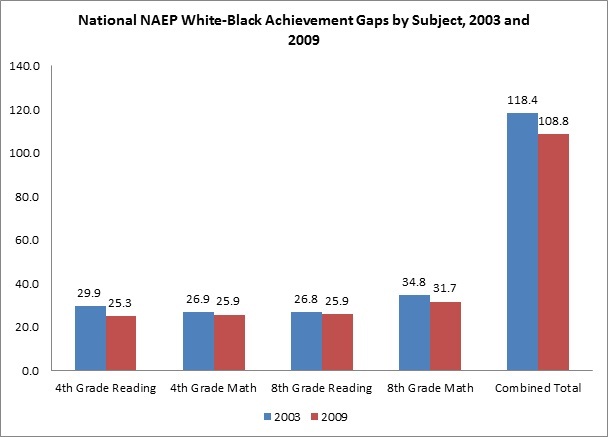 The above chart measures the national White-Black achievement gap for all four of the main NAEP exams for the 2003-2009 period. Mind you, that on these exams, 10 points is approximately equal to a year worth of average academic progress. These are White scores minus Black scores, with the 2003 gaps in Blue and the 2009 gaps in Red. In Jay’s post below, you can watch a Fordham discussion that includes debate over whether we have fallen into the grip of “achievement gap mania.” If so, we have precious little to show for it. We did have some narrowing of the achievement gap between 2003 and 2009, but at two and a half plus grade level gaps in all four subjects. Start your low-calorie, carrot juice diet and mark your calendar for 2075 or so, assuming that we can maintain today’s glacial pace of closing. While I do sympathize with the argument that we need to get everyone to understand their stake in education reform, I must say that there is a reason why people are passionate about achievement gaps. The term “disgraceful” does not begin to describe the catastrophic failure represented in the charts above. Black and Hispanic children score little better than what the average 1st to 2nd grade Anglo student would score on a 4th grade reading test. It’s only the developmentally critical literacy acquisition window after all. The focus on the achievement gap is important because it cuts to the heart of American ideals. We believe in equality of opportunity. We believe in meritocracy. 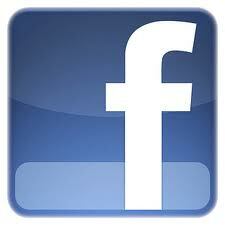 We believe in class mobility and self-determination. Call it the triumph of hope over experience if you wish, but we believe that public education can help achieve all of this and we refuse to give up on the notion. The terrible truth of course is that our public education system is pervasively classist to an extent that goes far deeper than the naive equity funding attorneys ever seemed to grasp. If we auctioned the limited supply of high quality public school seats on Ebay rather than covertly through mortgages, perhaps all of this would more transparent. If we could tag our highly effective instructors, we could watch a time-lapse film of them fleeing dysfunctional school systems for the leafy suburbs and/or leaving the profession entirely. Increased resources could in theory ameliorate these problems, but strangely enough they didn’t. lack evidence on costs and results. The sad thing is, some are so desperate to maintain the above paragraph that they are willing to ignore the consequences, including the two charts above. They comfort themselves with excuses. Blah blah poverty yadda yadda video games. Whatever. I’m not saying that achievement gaps are the sole responsibility of schools, or that we will live to see them completely closed. I agree with Rick Hess that there are serious shortcomings to a reform strategy solely based on gaps. We can however do a hell of alot better than this. We focus on achievement gaps not because it is expedient, but because it is necessary. There are an endless number of interesting stories that could be told with this information, but the one that really stood out to us is that achievement in many of our affluent suburban public school districts barely keeps pace with that of the average student in a developed country. People who flee from urban education ills thinking that their children will get a top world-class education in the suburbs may be disappointed. The suburban education is usually better than in the city, but it would may not be preparing students to compete for top paying jobs in an a globalized jobs market. The last blog post contained some criticisms about whether the assumptions for the analysis were reasonable. Josh McGee replied in the comment section of that post. And NCES Commissioner, Jack Buckley, told Education Week that “The methodology in this report is highly questionable.” This assessment is a little strange because what we did was similar to what the U.S. Department of Education has done in several past reports linking international test results to state NAEP results. (See for example this.) We just bring the results down to the district level. If ours is highly questionable, then the U.S. Department of Education’s own efforts must also be questionable. You are currently browsing the archives for the myth of helplessness category.